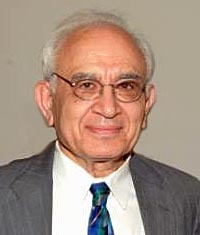 Thomas L. Saaty is an American mathematician serving as a Distinguished University Professor at the University of Pittsburgh, where he teaches in the Joseph M. Katz Graduate School of Business. He is the inventor, architect, and primary theoretician of the Analytic Hierarchy Process, a decision-making framework used for large-scale, multiparty, multicriteria decision problems, and of the Analytic Network Process, its generalization to decisions with dependence and feedback. Dr. Saaty has made contributions in the fields of operations research (parametric linear programming, epidemics and the spread of biological agents, queuing theory, and behavioral mathematics as it relates to operations), arms control and disarmament, and urban design. He has written over 30 books and 300 papers on mathematics, operations research, and decision making. Their subjects include graph theory and its applications, nonlinear mathematics, analytical planning, and game theory and conflict resolution. Saaty has been elected to the National Academy of Engineering (2005), and the Real Academia de Ciencias Exactas, Físicas y Naturales (Spanish Royal Academy of Sciences, 1971). In 1973, he received the Lester R. Ford award from the Mathematical Association of America for the expository excellence of an article of his on the four color problem, and in 2000 he was awarded the gold medal of the International Society on Multi-criteria Decision Making. He is the 2007 recipient of the Akao Prize of the QFD Institute. Prior to coming to the University of Pittsburgh, Dr. Saaty spent ten years as a professor at the Wharton School, University of Pennsylvania. Prior to that, he spent fifteen years working for U.S. government agencies and for companies doing government-sponsored research. His employers at that time included the Operations Evaluation Group of MIT at the Pentagon, the Office of Naval Research, and the Arms Control and Disarmament Agency at the U.S. State Department. PhD, Mathematics, Yale University, 1953 (thesis, under Einar Hille: "On the Bessel Tricomi Equation"). Post-graduate study, University of Paris, 1952-53. MA, Mathematics, Yale University, 1951. MS, Physics, Catholic University of America, 1949. BA, Columbia Union College, 1948. This page was last modified 16:52, 13 February 2009.